Charme 18 ° secolo Country Home con piscina e bella vista del Luberon! Benvenuti a L'Etoile, un 18 ° secolo, in pietra provenzale rustico situato tra Roussillon e Gordes - due dei più bei villaggi di Provenza! Situato in un piccolo borgo, L'Etoile significa: "The Star" - e capirete perché di notte, quando migliaia di stelle ricoprono il cielo di notte! L'Eotile siede su più di un acro di terreno con vista mozzafiato sulla valle circostante Luberon e il villaggio collinare superiore del Roussillon. La proprietà è molto ben posizionato, esposto a sud con vista sulla valle, oliveti, frutteti e vigneti e solo a breve distanza a tutti i famosi borghi della Provenza. La casa a tre piani è stata recentemente ristrutturata da uno dei migliori maestri di ristrutturazione in Provenza. È perfetto per un massimo di 8 persone e una grande installazione per due famiglie. Una delle migliori caratteristiche della casa è la grande piscina e cucina estiva, con splendida vista sui giardini, gli uliveti, vigneti e il villaggio di Rossiglione. - Cozy Salon - Una sala relax con camino in pietra e un vecchio, travi a vista, completo di lettore CD / stereo e portatile (batteria carica) Bose docking station per iPod per gustare all'interno della casa o verso il basso in piscina. Una delle parti migliori di L'Etoile, c'è una casa ulteriore pietra che funge da cucina pool house e l'estate. L'accogliente cucina è completamente attrezzata con frigorifero, lavastoviglie e tutte le pentole e stoviglie per servire un gruppo di 10. C'è un camino per cucinare e una stufa a gas a due fuochi. Vi è anche un mezzo bagno all'interno dell'edificio e una zona doccia esterno privato con acqua calda e fredda che si amano usare. Il bellissimo edificio si apre completamente al grande piscina e giardini in estate. I giardini sono molto appartata e sono pieni di cespugli di lavanda, rose, erbe aromatiche, alberi da frutto, e varietà a fioritura stagionale che sono tutti circondati da un boschetto di alberi di ulivo che creano un meraviglioso ombra pomeriggio e la privacy. Ci sono un sacco di posti per salotto a bordo piscina o leggere e pisolino all'ombra degli alberi. Di notte, il cielo è completamente ripreso dalle costellazioni. E 'sorprendente vedere il cielo notturno in una bella cornice così naturale. Abbiamo spesso ammirare le tante stelle cadenti! In estate si può cucinare e gustare i pasti nella cucina estiva a bordo piscina. Quando le notti sono più fresche, accendere il camino e gustare i vostri pasti in profondità di fuoco. Il prezzo settimanale di affitto comprende 3 ore di pulizia della casa a settimana. Inoltre, la connessione Wi-Fi e chiamate gratuite verso la Francia e gli Stati Uniti sono inclusi. Prenota la tua vacanza ora a L'Etoile. Controlla il nostro calendario qui sotto e prenotare la vostra vacanza da sogno nel cuore della Provenza! Abbiamo un portatile (batteria) docking station per iPod Bose così portare il proprio iPod! La maison correspond au descriptif, aucune mauvaise surprise. Elle est agréable à 8 personnes. La cuisine d'été qui est un bâtiment indépendant donnant sur la piscine permet de manger sur la terrasse (le nombre de parasols est suffisant) à côté de la piscine avec une superbe vue sur le des oliviers et la ville de Roussillon. Elle est totalement équipée aucun besoin d'utiliser la cuisine de la maison. La maison est bien placée pour visiter le Lubéron. Le propriétaire est sympathique et disponible pour rendre votre séjour le plus satisfaisant possible. We just spent a week with our kids (10 and 12) and my parents in law at l'Etoile. The house was everything we had hoped for and so much more. Looking at the beautiful pictures in the listing it may be hard to believe they really do the place justice, but they really do. The setting was great: very close to both Roussillon and Gordes (a 10-12 minute drive to either). The location itself was very quiet and peaceful - there are some other nearby houses, but otherwise you're surrounded by olive groves and wineyards. The house is divided in to two buildings - the main house and the pool house/summer kitchen. We adored the summer kitchen and spent almost all our time at the house there. There were several parasols and very comfortable lounge furniture, plus a killer view! The house was well equipped and all the furniture and amenities were high standard and very comfortable. My husband in particular enjoyed the Nespresso machines! The one thing I would say is that I probably would not stay at this house with toddlers. The stairs down into the summer kitchen do not have a railing and the stairs in the main house are spiral and though they have a railing are very open and could be difficult with an exploring toddler. Finally, to boot, the host was very responsive and helpful. My extended family recently visited Provence to celebrate my mother's 70th birthday and had the joy of staying at L'Etoile. Having visited the area before, we knew we wanted to stay near Roussillon and L'Etolie was the perfect location to see all the near by villages and even make a day trip to Marseilles. The house was even more charming then described, with everything needed for all of our generations of guests. The kitchen, pool and bedrooms were fully equipped and the perfect balance of functional and charming. We ate out at the nearby restaurants that were delicious, but also cooked and enjoyed meals at this beautiful home. Stephen was an excellent host, extremely responsive and ensured we had everything we needed for our trip, even delivering bicycles for us to ride during our stay. We couldn't have asked for a better trip. Thank you Jessica. You and your family are welcome back anytime! We drove to l'Etoile from the Nice area and stayed there from Sept. 29 until Oct. 13. It was a wonderful experience. The owner has prepared a booklet describing in detail what you need to know about the property including how to run the dishwasher and washing machines, how to get to the separate summer kitchen with pool, where to go to find the best markets and restaurants in the area and much more. The bedrooms were spacious, the beds comfortable and the supplies throughout the house were plentiful and well thought out for guests. The owner was quick to reply to our email questions on two occasions. The surrounding fields of grapes and lavandar are beautiful as are the flowers and olive trees surrounding the summer kitchen. The nearby towns of Gordes, Roussillion and Apt provide lots of options for shopping, dining and exploring. This is a top-notch place to stay in Provence. L'Etoile is a beautiful place. Our visit to L'Etoile was the highlight of our month-long vacation in France. The house exceeded our already heightened expectations. Steve and John have done a masterful renovation to the house. It is well equipped. They've thought of every detail to create a comfortable, functional vacation house. The beds/bedding/pillows/towels are very comfortable. Both kitchens are totally functional and nicely equipped. The outdoor grilling area was perfect for cooking our Provencal dinners using the fresh, delicious ingredients we procured from the local village markets nearby. Outside dining areas are fantastic - we ate every meal outside. The photos do not fully convey the beauty of the home and its views of Roussillon and the Luberon valley. The views of Roussillon are really magical from the house and the summer kitchen/pool area. The house easily accommodated our 2 families. There is enough room inside and out that you do not feel like you're on top of one another. At the time of year we visited - June - you wanted to be outside as much as possible. Setup of the rental with Steve was very easy and he was very responsive in his communications and in answering all of my questions. 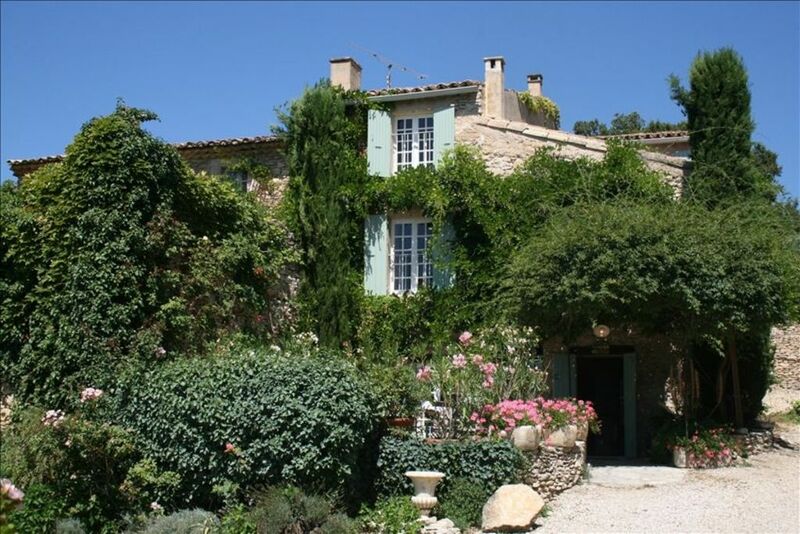 In our opinion, this house is a perfect place to spend a vacation in Provence - I highly recommend it. Thank you Jude - I'm glad your 2 families were able to enjoy the house and the area. What can we say? Not enough words or photos to fully appreciate 'L'Etoile' and it's immediate surroundings! Everything that others have written already are true and then some. We have particularly appreciated the feeling of 'home' here, waking to the gorgeous view of Roussillon and the sounds of the birds each morning! We are easy access to Roussillon and Gordes for our morning croissant and to be there as the towns wake up before day tripping crowds arrive. We've enjoyed meeting some of the locals who have become friends of the villa owners. We've had the best time just exploring the countryside and it's villages -- everyone having a unique quality. Right around the corner is the village of Lioux, a gem. And Goult and Perotot. And the Luberon route to Lourmarin and the gorge route to Venasque. The list goes on and on. Wish we could stay a month here. L'Etoile makes it all so easy! Thank you, thank you, thank you! Thank you Cassie and Mickey - sounds like you had a great trip! We love nothing more than being at L'Etoile with our family and friends. And glad you got to meet all our friends in Roussillon.